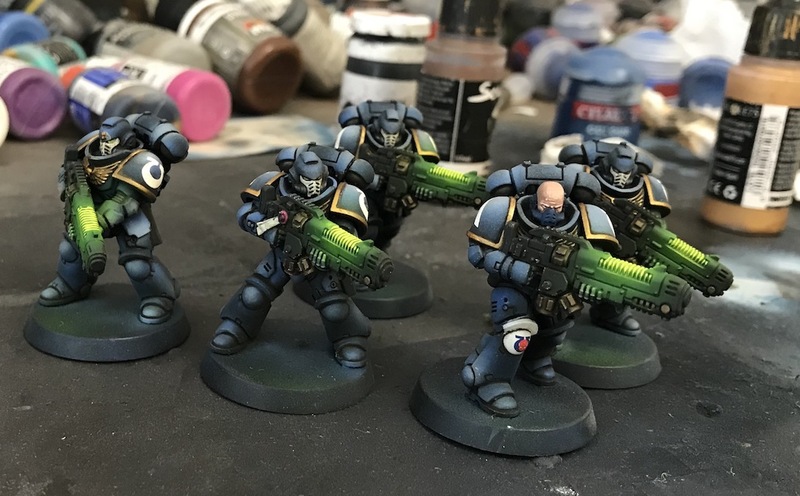 More Primaris progress. I now have quite a bit of the new Primaris stuff painted. The temptation is to paint something else now, maybe something from the last Space Marines release that has been gathering dust. It is kind of embarrassing to have stuff unopened from releases years ago, but was the norm for me. The new model is to paint stuff up as I buy it. It can't go directly into long term storage. So what should I paint next? Looking good! Been building my own Hellblasters from the boxed set for my Dark Angels. Great inspiration for me to carry on here. 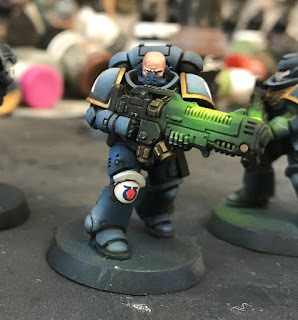 You have captured a clean and very unique look for the Ultramarines here.I prefer your toned down blues on these guys. I appreciate that. I've been trying to paint up a more subtle force. Those I suppose those radioactive looking guns don't do that! These are completely over the top. I was painting at night and didn't realize how much I had put on. These guys look positively radioactive. I painted by candlelight one night. That was messed up when I saw it in the daylight! I've got centurions, vanguard, veterans, and calgar. I'm leaning towards centurions just to see how they turn out. Really love the high contrast armour. I am assuming you come back to line between the armour panel after the airbrush step, correct ? Yes. That brings the definition back. 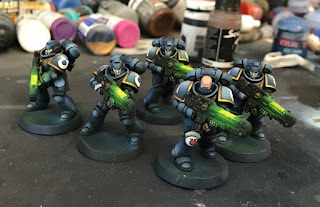 If I am painting a display model, I will also use a brush to blend the edges and adjust the air brushing as if it were a rough cut. OOH, glowy glowy. I like them OTT, especially in contrast to the subtle approach to the armour itself. They are growing on me. It makes it really easy to see where the plasma units are in the army. They stick out like spotlights!